Found in Chiapas state of Mexico at elevations around 120 to 130 meters as a medium sized, hot growing terrestrial that blooms in the spring on an erect, elongate, several flowered inflorescence with the flowers all held towards the apex. 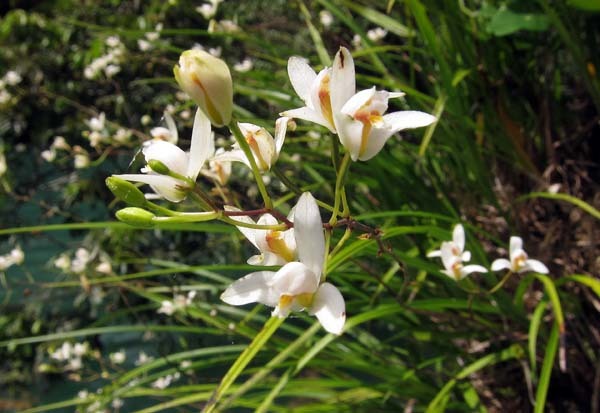 This amazing orchid lives on riverbanks where the plants survive submerged for most of the year in the streams then in late winter the water levels recede and this orchid puts out a new lead and by April it is in flower and by early May the flowers have encapsulated and the capsules matured and the seed starts to fly. By late May the plant is again submerged for another year.